This spring we ripped into good ol’ #1!!! This spring we ripped into good ol’ #1, yep, she was our first baby we put out there to see what we could catch; and catch on we did! We figured, heck, we’d price it just like Uncle Earl did his car paintin’ business! $59.95! Yee haw! So me and Paw Paw went in and painted the joint and called her good to see what might happen! Well as fate would have it, it took off like a wild fire, and then we added #2 and then #3. 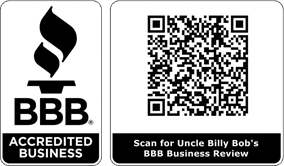 Whoops, got side tracked…back to my story, so it’s comin’ up to nye on 4 years (Sept) that we started, so UBB #1 really needed a face lift and a dish-a-washin’ machine, since the women folk didn’t want to have to do the dang dishes on their VA-CA-TION! So this winter we remodeled the kitchen and opened her wide up! She’s got a nice view now, you can see the ol’ Youren Ranch up on the hill out the kitchen winder and there’s a whole lot more space to kick up your heels! And that’s right gals, it’s got a dis-a-washing machine too, they all do now! We also added a propane stove in the livin’ room so in case we have any power outages, you won’t be so dang cold! Also added a new 32” flat screen TV and 40+ dish network stations! So now folks won’t complain about our little itty bitty 12” TV we used to have, but what the heck it was still a TV! Then this spring, me and the boys Grady Bob and Casey Bob, tore into her some more and put in all new vinyl windows with SCREENS, yep you heard me right, you can open up them there winders and the critters don’t come a flyin’ in! Put in all new floorin’. Then we renovated the master bedroom so you can look out that purdy new window at the view. We also freshened up the paint and stained all the ugly trim, so it’s pretty high faluten! They we went outside, and painted her all up purdy and such. We tore out all the old boards on the patio side, so y’all have a nice view of the river just cross the road. We added a dining table and here’s the real exciting news, we put in an electric mosquito killer chandelier, so if you need any extra protein, just wait a few secs till something flies by and lights up the night!!! Zap! More dinner! Now you can have a nice dinner right under the covered patio! We still got the fire pit for those nice sing a-longs, and it’s still always Christmas at #1 and Rudy, the partee antelope is awaitin’ your arrival! So y’all come back now, ya hear! Or if you haven’t tried us out, what the heck are y’all a waitin’ for?? ?